I know so many are talking about what we want now, or how we need to change this, that, or the other thing. But I would like to add to the suggestion list for things to come. I have no wish for the game to advance through the evolutions to fast, and started thinking about what things would be cool for tribes to have to build as a group and not only look cool but would benefit the tribe. The first thing that seemed to jump mind was Mills. Not sure how much we may have need for them as I realy don't know what the plans are for food and agriculture, But at lest one should work for now. Both would be great for .... Milling. But like I said Not sure how much this would be needed. But thought it would be cool to have in game and would work like a very large work station. 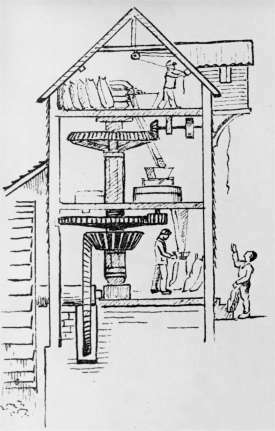 The last mill I can think of would work right now in-game. As we already are building things and have woodworkers. Anyway, I know we would have to wait for the evolutions to make there way to this point, I think this would look cool, And help in mass production of grain and wood products. Also, a favorite of mine would be an "Archimede's Screw" type devive to bring water up from lower areas.